Russia invaded Georgia and Ukraine. Who’s next in Eastern Europe? 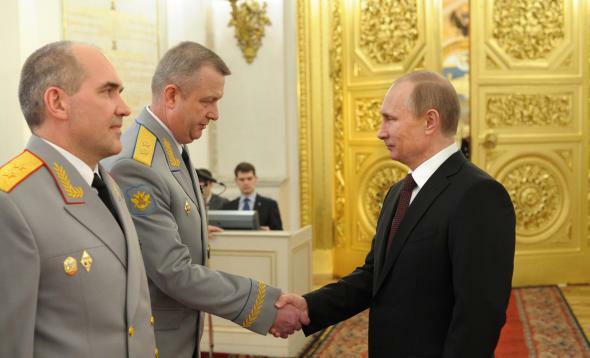 Russian President Vladimir Putin meets senior military officers on March 28, 2014, as he congratulates the armed forces for taking over Crimea. A month after seizing and annexing Crimea—and with thousands of troops still massed on its border with Ukraine—Russia says it’s being unfairly portrayed as a menace. Good luck soothing your neighbors, Mr. Lavrov. Your deeds speak louder than your words. In politics, clever propaganda can give you a marginal advantage. But past a certain point, reality overpowers spin. One big crime or fiasco wipes out all the rhetoric. Kermit Gosnell, the ruthless rogue abortionist, gutted public confidence in the regulation of clinics. The horrendous debut of healthcare.gov soured millions of people on government-supervised health insurance. The invasion of Iraq, followed by years of chaos and a failure to find weapons of mass destruction, destroyed Americans’ appetite for war. That kind of reality now dominates Eastern Europe. Russia is eating its neighbors. Six years ago it severed two provinces from Georgia. This year it devoured Crimea. Now it has thousands of troops deployed near Ukraine’s eastern border—up to 40,000, according to NATO estimates—backed by helicopters, tanks, and artillery. Meanwhile, Russia is threatening to cut off its gas supply to Ukraine and, by extension, European countries that rely on pipelines running through Ukraine. The countries in Russia’s path aren’t stupid. Lithuania has announced coordinated defense measures “in the context of threats.” Poland is asking for two heavy NATO brigades. Romania is conducting military exercises with the U.S. and requesting “an eastward repositioning of NATO’s naval, air and ground forces.” Estonia is turning one of its military airports into a NATO base. “Everyone in Europe, and not only in Europe, should be worried,” says Estonia’s prime minister. These countries don’t need NATO propaganda to tell them Russia is a threat. Russia’s troops, tanks, and land grabs have made that case convincingly. You can’t talk your way out of this one, Mr. Lavrov. The only way out is to take your guns and go home.